Archie #1 Re-Launch is #7! 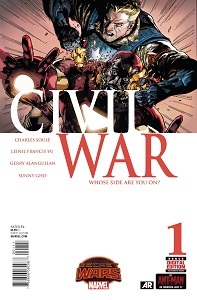 More of the same for Marvel, Secret Wars and Star Wars filled 8 of the top 10 slots. They’re selling the heck out of Star Wars, making it pay off way more than Dark Horse did. The Archie #1 relaunch by Mark Waid and Fiona Staples was the #7 seller, the 1st time I ever recall Archie being in Diamond’s Top 10, and deservedly so, it was a great read! It was also enough to jump Archie up to the #6 overall Publisher, ahead of BOOM! and Dynamite. DC only made it into the top 10 with a single book, Batman #42 at number 5. Not surprising since Batman is historically DC’s best seller (in case you ever wondered why they publish LOTS of Batman books…) DC should worry less about “beating Marvel” in the sales and more about not slipping to the point where they are overtaken by Image. 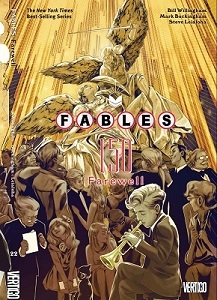 Fables #150 (the final issue) did double duty as TPB #22. It’s all original content and a single final comic story, though a really LONG one. Maybe it fits the true definition of a Graphic Novel better than the collected editions that people normally call “graphic novels”, but it was Fables #150, so I’d have liked to see it over on the comics list. Full sales data is available on ComiChron. 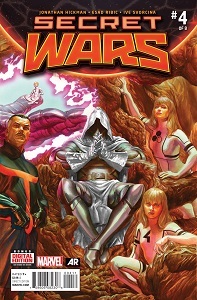 (BALTIMORE, MD) — (August 7, 2015) — The surviving heroes of the Marvel Universe confront Doom and his Thor Corps in Jonathan Hickman and Esad Ribic’s Secret Wars #4 from Marvel Comics, the best-selling comic book in July 2015 according to information provided by Diamond Comic Distributors, the world’s largest distributor of comics, graphic novels, and pop culture merchandise. 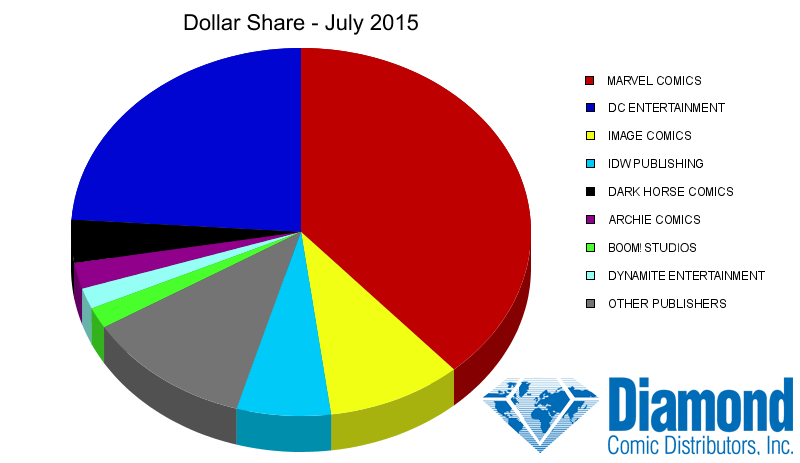 Marvel Comics was July’s top publisher with a 38.43% dollar share and a 41.59% unit share. DC Entertainment was the month’s number two publisher with a 23.94% dollar share and a 24.30% unit share. 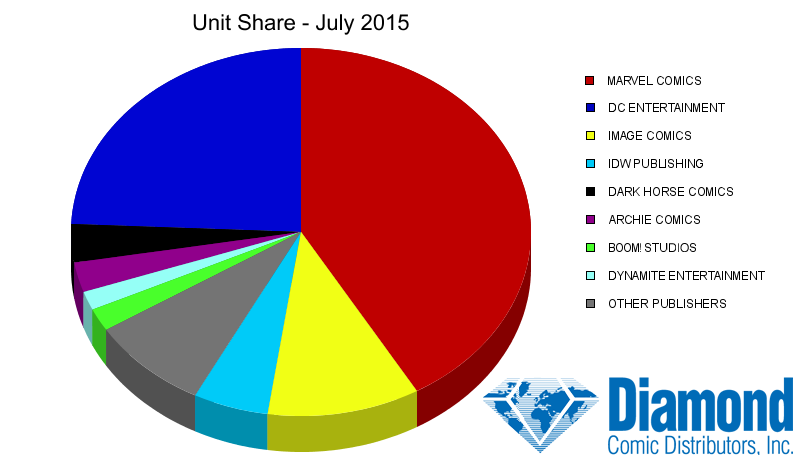 July’s number three publisher was Image Comics with a 9.48% dollar share and a 10.72% unit share. In fourth was IDW Publishing with a 6.60% dollar share and a 5.28% unit share. Dark Horse Comics placed fifth for the month with a 3.77% dollar share and a 3.36% unit share. 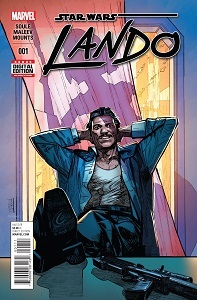 In July, Marvel Comics had eight titles among the top ten best-selling comics, including Charles Soule and Alex Maleev’s Star Wars: Lando #1 at #2 and Soule and Leinil Francis Yu’s Civil War #1 at #3. Scott Snyder and Greg Capullo continue their impressive run on their current adventures of the Dark Knight, with DC Entertainment’s Batman #42 coming in at #5. Also in the top ten was Mark Waid and Fiona Staples’ Archie #1, a modern relaunch of the venerable character from Archie Comics, at #7. Bill Willingham’s long-running fantasy Fables came to its conclusion in Fables Volume 22 from DC Entertainment’s VERTIGO imprint, the best-selling graphic novel for July and one of the publisher’s four volumes in the top ten. 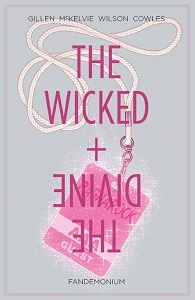 Image Comics had two titles among the top ten, with Kieron Gillen and Jamie McKelvie’s The Wicked & The Divine Volume 2: Fandemonium as their best-selling graphic novel at #2. 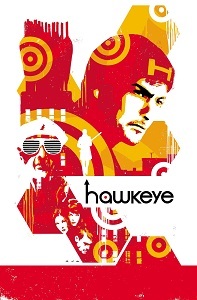 Marvel Comics had two titles in the top ten, led by Hawkeye Volume 4: Rio Bravo by Jonathan Hickman and David Aja at #3. Gemstone’s softcover edition of The Overstreet Comic Book Price Guide Volume 45 was July’s best-selling book, and the hardcover edition ranked #2 for the month. DC Entertainment’s DC Comics Blueline: Batman By Jim Lee San Diego Comic-Con 2015 Exclusive Action Figure, a unique new action figure that boasts a design based on Lee’s pencil artwork of the Dark Knight, was July’s best-selling toy and one of the manufacturer’s five products in the top ten. Also in the top ten was Diamond Select Toys with two products; the Marvel Select: Deadpool Action Figure was their best-selling product at #2. The Marvel Dice Masters: Avengers: Age of Ultron Foil Packs, an expansion for WizKids/NECA’s collectible dice game based on Marvel Comics’ Age of Ultron comic book, was July’s best-selling game product. This entry was posted in Comics Sales and tagged Archie, Batman, DC, Diamond, Fables, July 2015, Marvel, Sales, Secret Wars, Star Wars, Top Sales. Bookmark the permalink.